Welcome to robert aziz dot com—the official portal to the writings and professional work of Robert Aziz Ph.D. Please enjoy exploring the descriptions, excerpts and reviews of the publications you will find posted on this site, as well as the information provided on his analytical and business consulting practices. Please also regularly return to robert aziz dot com to catch the most recent journal entries. 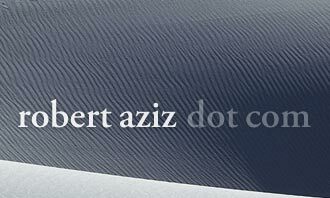 Click here for a more detailed description of Robert Aziz’s publications and professional work. The experiential transmission of knowledge has long been held by the consciousness and enlightenment traditions to be the highest level of instruction and as such the most difficult to master. Indeed as soon as we step beyond the provision of knowledge for the purposes of what I would term “retentional education” and take as our task the advancement of others psychologically and spiritually, in a manner, moreover, that is attuned to their unique developmental needs, we find ourselves in altogether different territory. The transmission of knowledge for the purposes of retentional education does not require of its students a willingness to descend experientially into a process of personal challenge and transformation. In fact, it often eschews such initiatives. But when the intended outcome of the transmission of knowledge is enlightenment, a sacred circle is drawn in which the requisite descent is hastened by way of the direct, experiential transmission of knowledge within the actual instructional process. The quest for eternal youthfulness has captivated humanity for centuries. World mythologies, the arts, not to speak of actual historical events, provide more than glimpses into our preoccupation with this problem. Recently this quest has taken an altogether new direction with ever-increasing numbers of people seeking salvation in the now burgeoning industry of pharmaceutical and surgical anti-aging interventions. Shocking as this may be, especially given the surreal and at times lethal consequences of these interventions, I do not regard them as uniquely condemnable, since throughout history those looking to enhance their physical beauty have subjected themselves to comparable, if not more severe ordeals. What I would say about them, however, is that even when optimal aesthetic effects are achieved, such results in no way correlate with what I have in mind in speaking of youthfulness. If the Fountain of Youth were to mean anything, I could only imagine that it would have to offer us more than a mere physical upgrade. Revised by Dr. Robert Aziz from his 2009 Huffington Post article of the same title. It is a curious fact that New Year's Eve is synonymous with getting wasted. How do I define wasted? Technically put, it would denote party-related excess that leaves one feeling like crap (ill and depleted) the next day.